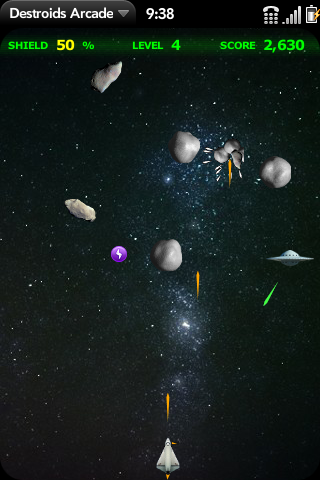 Fly your space ship through an asteroid field and destroy all asteroids to reach the next level. Defend yourself against enemy UFOs and collect shield energy from them to repair damage from collisions and laser hits. On each level the number of asteroids and their speed is increased. This is a variant of the original Destroids with a different Galaga-like game play. This game is currently in development. The game play may change drastically.